Channelings – Freedom For Humanity! Posted on October 10, 2017 October 10, 2017 by TheLightHasWonPosted in Channelings, SpiritualityTagged 12 strand DNA codes, 12 strands, Ascended Masters, Ascension, Awakening, Channelings, Compassion, Confusion, Discernment, Disinformation campaign, DNA Activation, Energy, Energy parasites, False dates, False hopes, Free Will, Frequency, Galaxies, Galaxy, Higher Frequencies, Higher selves, Human consciousness, Human grid, Illusion, Incarnation, Light, Love, Mind control programs, Move out of the matrix, MultiDimensional, Multidimensional starseeds, Parallel realities, Peace, PowerWithin, Prosperity, Spirituality, Star System, StarSeeds, the Matrix, Universes, Waves of energy. Use all that you have learned in 2016 to guide you through 2017. So much has been disclosed, and continues to be disclosed, that must be taken on board and used. The illusion that you were living under must be removed. Reality must be faced and dealt with. Those whose hidden hand controls your lives are now named and exposed. It is up to you now how you will deal with it. You must take back control over your lives, of your countries, and of your world. Refuse to support in any way the corrupt system that was criminally imposed on you. Refuse to buy into the fear that is being pushed at you from every angle. It is criminal how the threat of cancer is being used to infuse fear into your lives. You confront it every time you watch television. My dear wife uses a third of a teaspoon of Bicarbonate of Soda in hot water with a little lemon juice, every morning, to ensure she will never get cancer. It works. Bicarbonate of Soda is used by many doctors to cure cancer: research it for yourselves. Please understand that CANCER IS BIG BUSINESS for the drug companies. The threat of it is used heavily to cause fear because this prevents you from connecting with who you are. Cancer is a rod which they can beat you with. “LOVE OPENS UP A WINDOW TO THE SOUL” (Montague Keen). Where there is love, there is no room for fear. The Cabal would fall apart if you looked, with love in your hearts, at life and the future you wish to create. This is your greatest opportunity to change the course of life for everyone on Earth and to remove all that is evil. You must remove all that has made life on Earth a struggle to survive. Banks must go. They have an evil stranglehold on humanity and war is used to increase their assets. Banks have a stranglehold on every country. Ask youself who are they to dictate to the world? There will be a difficult period as you remove all of the corrupt system. Throughout history you have coped with worse things, so you will survive. There are good people who are ready to lead the way forward. The Cabal knows that it has lost the battle. Too much has been exposed about who they are, and how they use you as slaves to serve them. Your suffering gave them great joy and they have thrived on it. It has taken you a long time to wake up and see things as they really are, rather than as you believed them to be. Courage is needed now to remove every last vestige of Cabal control from your lives and from your world. Let this be your New Year resolution. Together, you cannot fail. Do not do anything that could possibly harm the human race. Protect each other. You entered the world with nothing and you will leave it with nothing. All that you have acquired, whether through good or evil, will be left behind. What is important is how you lived your life. Can you face the Source with a clear conscience? America is doing all in its power to create war with Russia before the corrupt ones leave office. You are being lied to. The Cabal believes that war can save them, as they are desperate to hold on to power. While you, the people, are killing each other, you are not looking at what the Cabal is doing. This provides them with the oxygen to survive. They are parasites who have lived well on your suffering and they demand the right to continue to do so. Is this what you want? What more do they need to do to you, before you say enough is enough and remove them from power. Stop being their servile slaves. Stand in your own power. America’s House of Cards is about to fall. The American people have been lied to so much. They are totally ignorant of what is happening all around them. America was infiltrated and taken over many years ago. It has lived on a knife edge ever since, while pretending to be a world power. It is like a great fish, floundering in the water, looking for war everywhere, in an effort to survive. There is no justice in America. The people are treated badly and there is no respect at all. Everything is false. It is an Alice in Wonderland situation. The parasites want America for themselves, to use as their headquarters. Americans, open your eyes and listen with open minds. See for yourselves what is being done to you, right under your noses. Ignore the lies that trap you, given to you by your TV news channels and newspapers, all owned by the Cabal. They only tell you what the Cabal wants you to know. Search for the truth which is all around you. Be discerning, as your very existence depends on it. The Cabal does not want you to survive. They want what you have. In my time on Earth, I saw how the human spirit was crushed through education. Every aspect of life on Earth became controlled. Televisions were placed in every household to ensure the masses were mind controlled. Education has produced mindless robots who believe everything they were taught. It was all engineered to create the robots that many of you have become. Now, you are beginning to see this for what it is, and you are rebelling against it. Consequently, THE CABAL IS RUNNING SCARED. SIEZE THIS OPPORTUNITY TO REGAIN YOUR FREEDOM. My dear, you face many challenges. We are working with you to attain the outcome that humanity needs. Together forever. Your adoring, Monty. Posted on January 6, 2017 by TheLightHasWonPosted in Alternative News, Channelings, SpiritualityTagged Awakening, Cabal, CabalParasites, Corruption, CorruptSystem, Heart, HumanitysAwakening, Illusion, Light, Love, RegainYourFreedom, StandInYourOwnPower, StopBeingSlaves, WakeUpAmerica, WakeUpWorld, World. Greetings, Light Family! We are pleased to have this time to speak with you today. We are aware that many around the world are dismayed at the apparent outcome of the presidential election primaries in the United States. Particularly, there is great disappointment that the more popular candidate, Senator Bernie Sanders, has not been given the Democratic candidacy, though many more millions cast their vote for him than for his opponent. Understand that elections have been rigged—bought, swindled, stolen, and riddled with voter suppression—for the whole of the United States’ history, as is the case in most countries. For understand that your very clear, very powerful individual and group intention to create a fair election, to elect someone to the presidency who is not only aware of their Divine purpose, but who is living it out fully, is still in the air. Still in the ethers surrounding the planet, and still influencing outer events in ways you cannot yet envision. There are no full-of-purpose, soul-expanding intentions in your world that do not affect outer events—that would be impossible. And your planet’s current political “system” is likewise feeling the effects of these powerful expectations of fairness, equality, justice, freedom, and abundance for all, just as it is feeling the effects of the powerful energies increasingly coming to Earth, and building new waves of increasingly higher vibration throughout Her being. There is no mistaking these powerful energy waves of higher intent, as they race out into the atmosphere, raising the level of human consciousness and calling forth every kind of higher help—Angelic, Ascended Master, and all other Divine resources of assistance. So that far from having missed your goal, you are reaching it. For now that the “frontrunners,” as they are called, are out as far as they can be in public eye and awareness, the veils that are quickly dropping on every level of outer life and consciousness on your planet are likewise dropping between them and the Truth of their lives. The carefully constructed façade of “I’m the one you want to trust to get the job done” is falling and dissolving so quickly, you would be overjoyed if you could see the full details of how completely their goings on will be exposed for all the world to see. Far safer for them to have hidden or carved out a plan of escape, as so many of their crowd are doing now. For now that they are out where all can see them, they will have nowhere to hide as the truth of their real sources of wealth, their true identities, their true “bosses,” and their true intentions are laid bare for all the world to see. And so you see the gentleman from Vermont continuing his heart-based dedication to serving the people not only of the US, but of the entire planet. The current US president also pledged such, and has carried that out faithfully, despite his duty as a double agent, in which he has apparently played out the preferences of the far right at times, in order to lay a more perfect trap for those guilty of human rights abuses on every level. And so understand that as with the dramatic (and tragicomic) stories in your books and films, all may appear to be darkest, just before the Light begins to appear over the horizon. We ask that you not doubt the coming Dawn, merely because you are still in the appearance of the night. Know that you are being sent every available help, and that the energies and higher intentions of the heavenly realms are reaching you in increasingly more powerful levels. For as human consciousness opens to each higher level of understanding, absorbing the beauty and freedom of Divine Love and Divine Will in ever greater amounts, you increasingly open to greater and greater levels and intakes of higher Light, making your transformation from a third to a fifth dimensional planet all the more real, with each passing moment. And so we would say, allow these strutting fools to play their part on the stage, and be glad for them. They have, in their ignorance and love of darkness, called forth from your high heart certain activations and intentions for growth, not only for yourselves, but for your entire planet, that could not have come forward otherwise. Indeed—this is where you as humankind separate the Light from the shadows, and all they have been hiding. And certainly, those crimes and intentions are more visible to you now, and therefore seemingly more threatening or annoying. Yet they nevertheless come forward now so that your Light sabers of Truth and higher consciousness can more easily spot these lower vibrations and cut off their access to life on your planet. Thank those who have come forward at this time, to play their part in this glorious unveiling of the new Fifth Dimensional human. They too have their role in the grand Universal scheme. And when the moment is right, they will recede from view, to be dealt with by those whose role it is to mete out justice to those who have broken Universal law and offended against all human life. Whether it is signing petitions or carrying placards for Peace and Justice at a public gathering, or simply blazing the Violet Flame throughout the planet and this entire election process. For this is your new reality. Know that you are not merely witnessing yet another “election cycle.” Even your bribed or threatened news pundits have been saying that this is not so. Know that you are witnessing—you are creating, as powerful Divine Creators do—the unprecedented miracle of a whole new dimension, a whole new form of life on your planet. Namaste, friends and fellow Light Warriors! We see your Divinity, and we bow to it. Whatever may occur around you, you are never alone. I am Judas Iscariot and I greet you all from above. Today it is wonderful day on Earth. The time of triumph is here and we rejoice with you all, all you children in the Light. You are in the Light now, dear children. The little dark that remains cannot hurt you any more. The Light is now shining over Earth and the dark is more and more scurrying into the corners. A new time is here now. It is time to start to enjoy and see the world with hopeful and trusting eyes. You are children of the Light and the Light is now resurrected through you. It is a powerful time of change that is now happening on Earth. 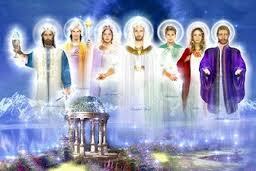 The announcement of NESARA and a new government will shortly happen and it will affect the whole Earth. All countries must look after their “houses” in the face of the possibilities that will present themselves. These are possibilities that they must grab hold of if they want to get on board the train. The new currency will be backed by gold, silver and precious stones. Other currencies will not have much value, as there is not so much behind them that support them. They are so called fiat money and are not worth more than the paper they are printed on. It is up to all governments to change direction now. They can also choose to resign and let others take over the ship. They become like ship rats and leave the ship, and leave it up to others to try to steer the ship to shore, hopefully with the help of more responsible people who have their people’s and countries’ best in mind. It is this way that we can change the world, with responsible people at the top who are supported by the people. They must be attentive to their people and make use of all the good ideas that can be found among them. It has to be an even distribution of men and women so that there will be a balance in the formation of laws that will be followed by all. Children can be asked in matters that concern them. Nature can be asked through people who can see and hear its need. We are all One and have the right to the best that life can give us. The journey has started, dear children, and everything will just get lighter for everyday that passes. You have succeeded and chosen peace and love instead of war and hate. You have completely turned around and your Creator now stand with arms wide open to receive you. It will be a year of jubilation, dear children of Earth, even if there is still work to do to clean Gaia from lots of toxins. New technologies will help with this. Ancient knowledge about ecological alternatives will emerge. Natural biological medication will replace the poisonous medication you digest today. Everything is already on Earth. It has just been blocked by the large industrial conglomerates who’s power and greed has not reached its limit. The suffering that its medication has caused has been large and multiple. There will be collaboration where one cares for each other. Such collaboration is already happening in some countries on Earth today. This you will see more of. One thing does not exclude another. The important point is that the starting point is the best for the people, so that they get a chance to heal and cure their bodies. The same is true for the earth that we cultivate. It needs the best that us humans can give it without us poisoning and polluting its land or water – Ecological and biological choices to return it to its pristine condition. One has been able to eat and drink on Earth during millennia and it has always been clean water in streams and lakes. This has now changed as you are well aware of, and measures are needed to restore the right balance again. You have a big job in front of you, dear Earthlings, but you will get all the help you need. Gaia is an “Honorable Jewel” in the universe and there are many who want to help with her ascension. You are far from alone. There is a myriad of life within and around here. All are eager to contribute with the knowledge they have. There is enormous knowledge that is available for Earth now in this phase of her transition. Everybody is sending their love greetings and they really shine when they turn down towards you and send their light-greetings of love. I send Light and Love to you and say farewell for this time.